Money can or can’t buy happiness? I think before I answer that question we have to draw the line and point out the obvious differences in the types of happiness available, and that one can attain. Don’t tell me that if you had enough money that would allow you to wake up every morning in a beach front property with the sound of waves as background music, panoramic sunrise you wouldn’t be happy? 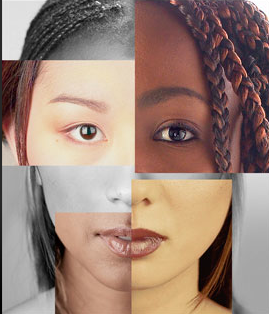 Maybe the question we should ask ourselves is: All things being equal, would you rather have money or not have money? Unfortunately, It is impossible to live without money, unless you moved to a faraway land that belonged to nobody, cut down trees to build your own shelter, dug a well for clean water, made your own candles and clothes, grew your own food and either walked everywhere (if there was anywhere to walk to!?) or made a bike, grew your own food or foraged for food, but that doesn't seem like a very attractive proposition does it? In some way, shape or form, we are all slaves to the almighty dollar! I wrote a piece a little while back, where I told you guys about the “indecent proposals” made by my friend, attempting to get me to name my price. Would I eat a cockroach, eat this or eat that. And the higher the dollar value got, the more willing I was to compromise my set standards. And that’s just the thing. Maybe the question is not really whether or not your life would be better off (or happier) with money. Maybe the real question is whether you’ve realize your price? Let’s talk for a moment about the physical, tangible results of money. I think we can all agree that on the 1st of February, you’d love to write that rent/mortgage check, pay that utility bill, handle the car payment and insurance, knock out your cell phone bill, and not even flinch. But what does it take to do that? It takes money. Let’s not even begin to go into groceries, gas money, activities, clothes, entertainment, and so on… Ladies, saw a beautiful dress you liked at Valentino? Gentlemen, saw that new Zegna suit in the window while you were walking by? Car enthusiasts; saw the ad for the new Mercedes E Class, where they explained how it’s the most advanced technological car in the world. Yup, you guessed it… that’s gonna take money. Obviously, these things don’t make everyone “happy.” I’m moving forward with the assumption that we are all on the same page here. The point I’m trying to get across is that, no matter what your thing is, I’m sure it will take money. And that will - in an indirect way - equal happiness through money. Money is a necessity. Money (of itself) is a standard for the exchange of goods or services. We live in a capitalist society, so most goods and services have a monetary value attached to them. Its importance is truly neither here nor there because of its obvious duty. Ask the homeless people how important money is.... you would receive a valuable education. Or, look into the percentage of divorces that were caused by money issues… a large number right? I hate to admit it but I'd have to say that money is high up there on my importance list of the road to happiness. While it may not necessarily buy love or happiness per say, it definitely can help to maintain it! Harvard University psychologist Daniel Gilbert writes in his best-selling book ‘Stumbling on Happiness’ that, "Psychologists have spent decades studying the relation between wealth and happiness and they have generally concluded that wealth increases human happiness when it lifts people out of abject poverty and into the middle class but that it does little to increase happiness thereafter." And to that I say: BE REALISTIC! Yes it does increase it a lot. No, money cannot buy happiness (there is no store that sells an item call “happiness”), but it sure provides for happy times. When you have enough money to pay the rent, the utility bill, buy food and clothing, have enough to go to the doctor when you’re ill - in real world – yes, money has a great deal to do with happiness. Money permits us to do and have things that we would normally have to do without. Therefore, we become happy. But don’t get me wrong, if you are a miserable person then come into money, it will divert you and temporarily switch your focus away from your misery but not necessarily make you happy. There are things in life that are inevitable. The Sun will rise and set, the days will not stop, the seasons will change, the birds will fly south for the winter and return in the spring, and the caterpillar will transform itself into a beautiful butterfly, and we will fall in and out of love. And for this I’m thankful… For each thing, we are powerless in their occurrence there are the ones that are momentary and only attainable with money. Money is good. It’s good if you have some but bad if you don’t have any and others do. Money is good but is it the root of all evil? Is wickedness caused by money? "For the love of money is at the root of all kinds of evil. And some people, craving money, have wandered from the faith and pierced themselves with many sorrows." I’m not clueless; I know the problem and misery that money can bring. We’ve all heard the popular saying “Mo’ money mo’ problems,” but I still believe that having money and access to it makes me a happier person. I would rather have the kind of problems a person with expendable resources has instead of the ones a poor person does… hands down! So while we like to think that the Love of money is the only root of all evil… I say in addition to the love of money, the lack of money is a bigger problem. It is true that money can't buy raw, organic, genuine happiness but IT does sustain it. 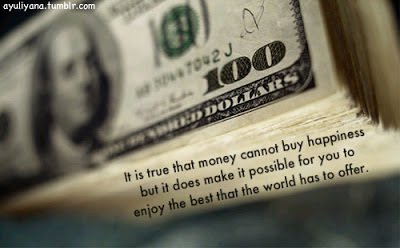 Money makes it possible for you to enjoy the best the world has to offer...so why wouldn't you want lasting happiness? Why wouldn't you want the best? Now my question is : do you consider yourself as somebody who does not have money?